How to make a professional Simple Construction Project Report? Download this Simple Construction Project Report template now! Adequate communication is essential in order to finish projects successfully. In order to gain truthful and accurate information, you need to make sure that program- or project managers are able to make rational and correct decisions. For those who have, what we call, a "high-performance mindset”, we know they prefer to work with the latest update of professional project management templates, in order to achieve their goals faster. We are certain this Simple Construction Project Report will be of value. 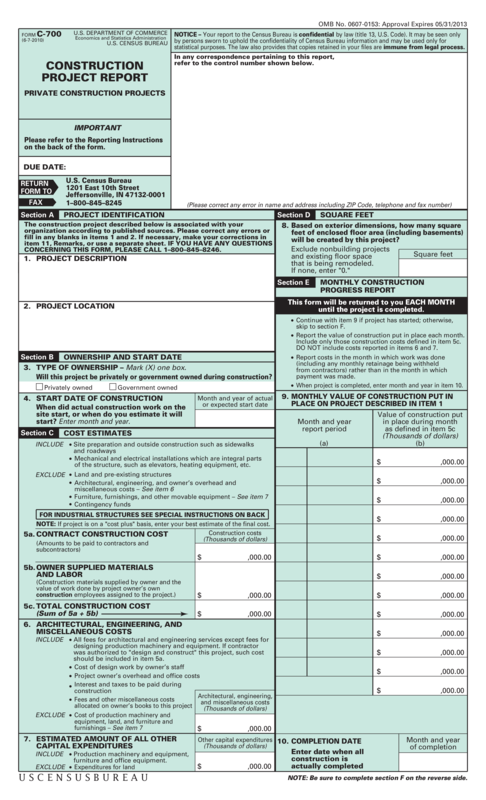 Feel free to download this Simple Construction Project Report, or simply browse through our other basic or advanced template designs. They are intuitive and in several kinds of formats, such as PDF, WORD, XLS (EXCEL including formulas and can calculate sums automatically), etc. Completing your Simple Construction Project Report was never simpler! Download this project management template now! 0607-0153: Approval Expires 05/31/2013 C-700 U.S. DEPARTMENT OF COMMERCE FORM (6-7-2010) Economics and Statistics Administration U.S. CENSUS BUREAU CONSTRUCTION PROJECT REPORT NOTICE – Your report to the Census Bureau is confidential by law (title 13, U.S. Code).. (a) EXCLUDE • Land and pre-existing structures • Architectural, engineering, and owner’s overhead and miscellaneous costs – See item 6 • Furniture, furnishings, and other movable equipment – See item 7 • Contingency funds FOR INDUSTRIAL STRUCTURES SEE SPECIAL INSTRUCTIONS ON BACK NOTE: If project is on a "cost plus" basis, enter your best estimate of the final cost.. TOTAL CONSTRUCTION COST (Sum of 5a + 5b) USCENSUSBUREAU ,000.00 ,000.00 ,000.00 ,000.00 ,000.00 ,000.00 ,000.00 ,000.00 ,000.00 ,000.00 ,000.00 ,000.00 ,000.00 ,000.00 ,000.00 INCLUDE • All fees for architectural and engineering services except fees for designing production machinery and equipment.. • Cost of design work by owner’s staff • Project owner’s overhead and office costs • Interest and taxes to be paid during construction Architectural, engineering, • Fees and other miscellaneous costs and miscellaneous costs allocated on owner’s books to this project (Thousands of dollars) EXCLUDE • Cost of production machinery and equipment, land, and furniture and furnishings – See item 7 ,000.00 INCLUDE • Production machinery and equipment, furniture and office equipment..